I am making available some Windows network tools that I have developed for my own use. Your ISP offers you 30MB of disk space, but doesn't tell you how much space is used! This tool enables you to get a usage piechart from your FTP service, showing which directories are taking the most space, and to drill down into those directories to see which are the largest files. Simply double-click on a pie segment to drill down! 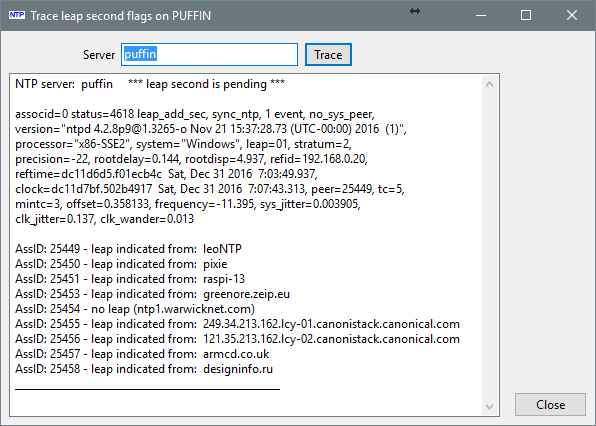 FTPpie is recommended by Blueyonder (UK broadband ISP, now Virgin Media), and works on Linux under WINE. and you will see the program working to retrieve your Web space usage details. Please note that the site name and directory details will be different for your ISP. Once the program has finished, a pie-chart like the one below will be displayed, and you can double-click on a directory to drill down and see its contents. This makes it very easy to clear out the maximum space with the minimum effort! For the recently released PWP2 service you will specify your address differently. Your old FTP upload address was: www.<aliasname>.pwp.blueyonder.co.uk, but instead you should now use: ftp.pwp.blueyonder.co.uk and enter your <aliasname> and <password> in the site details dialog. 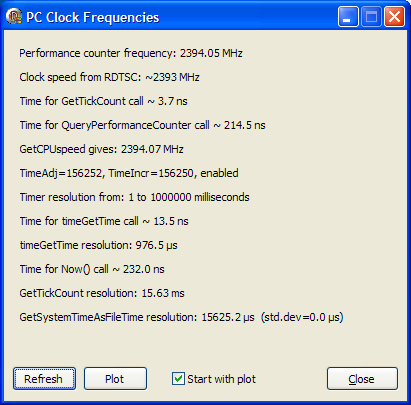 This program allows you to compare your PC clock with a number of external sources. You may have an Internet or GPS time service, but is your PC accurately synchronised to those sources, and how do they compare with one another? 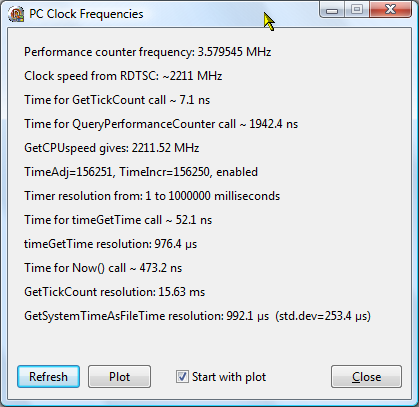 For the most accurate synchronisation, your PC needs an NTP client, which will connect to an NTP service on the Internet. Perhaps your ISP already provides such a service? What is NTP? It's the Network Time Protocol. As you can see from the screenshot below, it enables you to keep your PC within a fraction of a second of the correct time. Please see the NTP Web pages for more details about NTP. Find out more about my own experiences of running NTP on various systems. Take a look at my current NTP performance graphs. V5.1.0 Allow for more line colours, use line colours for node information text. V5.1.2 Add precision logging to file option (PL checkbox), add buttons for changing Y scale (replaces label click), click on right-half of clock face to refresh data, click on status bar for About... box, avoid history corruption when replies not received. V5.1.4 Enhancements to the display controlled by keywords in the clock list file - including the main window and taskbar titles, update time zone name and offset more frequently, "Delta" option not to plot unchanged values (but don't use this if your PCs are well synced! ), add "Plot only active" option, don't extend plot where there is no data, try harder not to prevent Windows shutdown when running. V5.1.6 Add to clock list file display control entries option for no case change to the specified title (-NOCASECHANGE). 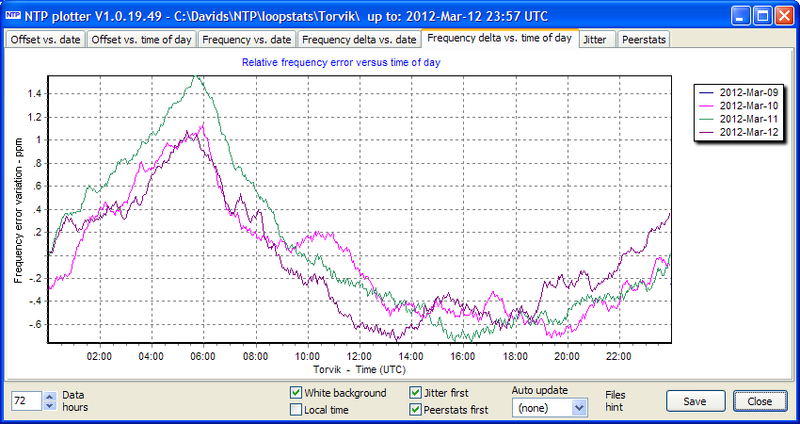 If you find the NTP Monitor useful, you can "thanks" by registering my Network Tools Suite here. Registration is mandatory for commercial use. by checking the Clean option, the reference clock is cleaned, so that glitches are removed. Note the area very near the right-hand side of the plot where all the plots go below the axis in the top set, but are corrected in the middle set. Regions where all clocks behave the same shows an effect in the reference. by checking the Smooth option, the noise from random fluctuations is removed in all graphs (bottom set), but single transients become spread out. During the tests on a Windows version of the NMEA/PPS ref-clock drivers, the need arose for a simple program to plot the performance. As a result, development of the NTP Plotter program was started to produce graphs of offset, frequency error, and jitter like those below, from the loopstats files which ntpd can produce. The offset plot includes an hourly RMS estimate of variation of offset about the mean offset level. The jitter graph includes an extra averaged value, presented on a more detailed scale, so that even small changes can be observed, such as the change from user-mode to kernel-mode time-stamping. The program will accept command-line parameters as either a directory containing loopstats/peerstats files, a single file, multiple files, or a Zip archive with peer/loopstats files, and you can drag-and-drop the same three sources onto the program from Windows Explorer. V1.0.20 Make "plot data gaps as zero" optional. V1.0.21 Make RMS compute on hourly boundaries. V1.0.22 Accept .GZ compressed data. V1.0.23 Try harder to find files in the current directory (should be named loop*.2* and peer*.2*), if no files found display File|Open dialog, option to show LAN-only peerstats (LAN defined as either 192.168.x.x addresses or 127.127.x.x addresses). V1.0.24 Faster plotting, pause while up/down buttons are being pressed. V1.0.25 Add option to control clip of offset data checked by default for better display of "spikey" data, update program caption when single file dropped, don't save peerstats graph images if no peerstats data. V1.0.26 Make data gaps more obvious. V1.0.27 Make all saved graphs the same size, just as they are displayed. V1.0.28 Accept directory names without the trailing "\", make legend text match line colour, if no graphs saved, suggest user check write-access to the data directory. V1.0.29 Warn if too many points are selected for plotting. V1.0.30 Click a cell or header in the peerstats table to sort (click again to sort in the reverse direction, right-click to copy table to clipboard), note that if there are nulls in the loopstats . the program will stop reading at that point. V1.0.31 Add option to save images with yyyy-mm-dd prefix. V1.0.32 Option to show full directory name, slightly improved speed of loading data, display message while loading. Note: please ensure that the ntpq.exe program is available from the path where the program is run, as the program relies on executing the ntpq command and interpreting its output. For those of you running FreeBSD or Linux, or if you prefer a program with the source you can inspect, here's a version very kindly provided by Terje Mathisen from Norway. During a recent period of GPS jamming I needed to discover which of my nodes was affected. It seems that nodes with antennas away from the street were slightly less affected (no, I couldn't see any unusual vehicles). I wrote a DOS script to check both my Raspberry Pi flock, and some named Windows and Linux nodes. The idea was to detect those node claiming PPS sync and list them with the output from the appropriate line from an ntpq -pn. There is a common subroutine, called with two different sets of node names, one for the Raspberry Pi cards (RasPi1..RasPi14) and again for named nodes (in the set nodes= command). The set node=%node:~-8% command ensures that the displayed node name is padded to make it a constanst width, so that the NTPQ columns line up as expected. Sample results when almost everything was working again, except for RasPi-3 which I had disturbed! Stands out, doesn't it? 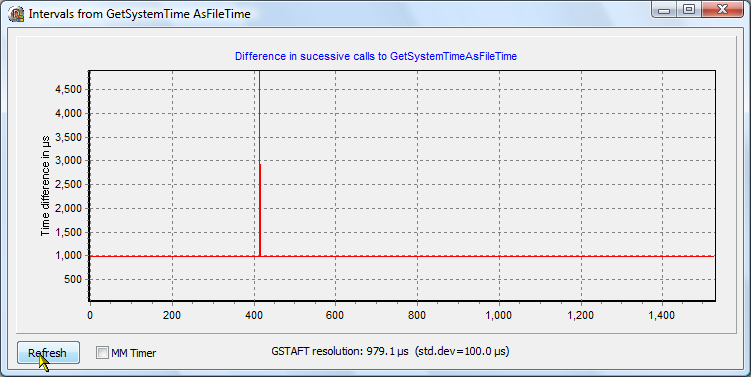 Small program to show the resolution (granularity) of the different system time calls on Windows, and the speed or otherwise of some of the calls. Unsupported - questions here. V3.0.8 2009 Jun 11 Add check of GetSystemTimeAsFileTime granularity, add Refresh button so you can just press <return>, Move to Delphi 2007. 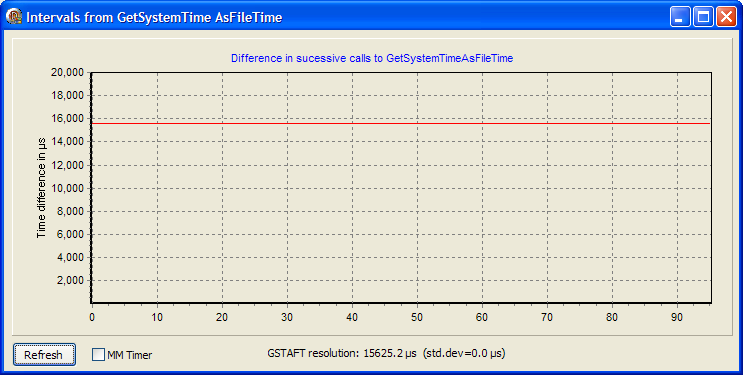 V3.0.9 2009 Jun 12 Add graph of GetSystemTimeAsFileTime calls, replace mean of GetSystemTimeAsFileTime by median. V3.0.10 2009 Jun 14 Add filtered mean value, ignoring outliers, very similar to the median, as expected. V3.1.0 2009 Jun 21 Compile with Delphi 2009. 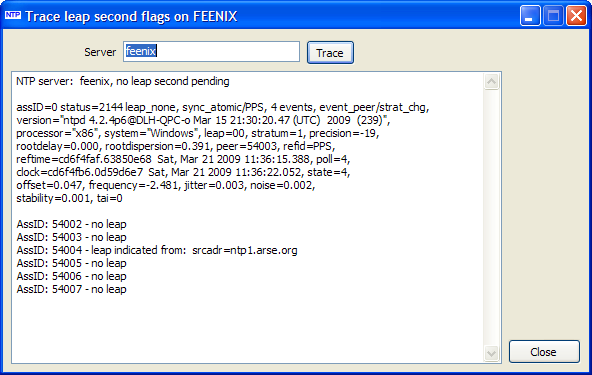 V3.1.1 2009 Dec 05 Update label captions displayed before running. Simple program to show the state of the serial port LEDs. Intended for watching the pulses on the DCD line from a pulse-per-second GPS used for NTP. Please note: If you are using Windows for NTP with a PPS signal, the DCD line must flash briefly on, not be mostly on flashing briefly off as inverting the PPS signal is not supported by the Windows NTP port.